In my time as a Barista, I’ve worked on a myriad of espresso machines. The first shop I worked at started with a La Marzocco (LM) GB5 EE then replaced it with a volumetric Kees Van Der Westen Spirit. The machine I was initially espresso trained on was a LM GS3 MP. I learned how to use a LM Linea EE at a cafe in a small tech start-up. As Houndstooth started opening new cafes, I used a Victoria Arduino Black Eagle (gravimetric model), LM Linea PB, and Mavam. Working as an espresso caterer and consultant, I’ve worked on everything from Breville to Unic, Slayer and Synnesso. Working this broad range of variety is familiar to a lot of professional Baristas. Even when your career begins like mine did - new Barista, new Cafe, new Machine - new machines break in, then they break down, they are fixed, they break again, they are replaced, and the cycle continues. Each espresso machine has innovations, quirks, little weirdnesses; and each is just different enough from the last one to make it challenging to learn to use. Many cafes have shift leads, trainers, coaches to help teach the difference between their machine and the next cafe. But few train their Baristas to use that machine to extract flavor specific to their brand. There are only so many brands out there and we’re all using them - but the flavor of our coffee could not be more different. I’m not going to tell you that there’s one way to pull espresso. I will tell you that everyone’s coffee can be better, can taste more consistent, and can be more on brand at any cafe. QSQ was designed to teach on four extraction models. Manual, Volumetric, Gravimetric, and Chronometric. When a professional Barista is dialing in, they use dose (and grind size of that dose), yield (or beverage) and time to articulate their recipe so that the next Barista can replicate or improve the flavor of their coffee. It’s a lot of balls to juggle - and in the Manual model, the Barista juggles all three variables all shift long. Volumetric, Gravimetric, and Chronometric models take out one variable for the Barista. In Volumetric, flow meters assist in determining the volume of beverage made. In Gravimetric, built in scales alert the machine when the designated amount of beverage is made. In Chronometry, the Barista sets a designated time of extraction. In each model, the Barista uses Dose and Grind Size differently to affect Yield or Time outcomes. How does one go about choosing a machine or extraction model for their company? And how in the world does one train or re-train Baristas for that specific extraction model? You can do what I’ve done, what most cafes do - grind it out in one on one training sessions for years or use Quid Spro Quo! 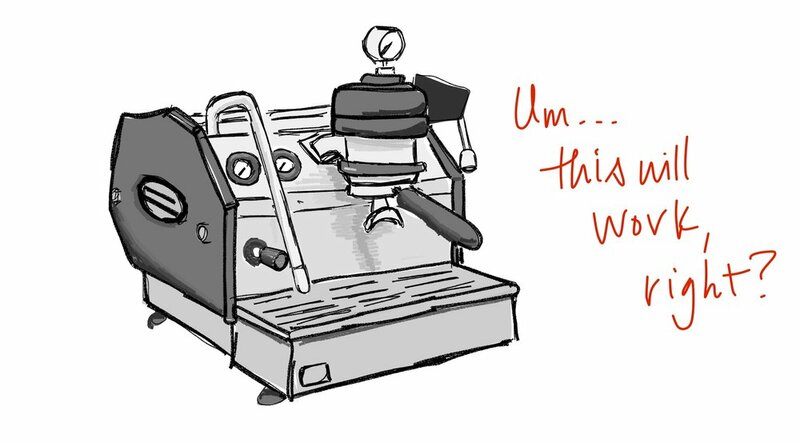 Our espresso modules are built for this specific problem. Each module is designed with games, exercises, and models to approach flavor with the specific style, flavor, and extraction model of any given cafe. Lastly, as professional Baristas, we all ask this question every few weeks or months, “What to expect when you’re expecting (new hires)?” Especially when opening a second or third cafe - as new tech becomes available, there is a lot of hill to climb as new staff are introduced to both “this is what our coffee can taste like” and “this is what coffee tastes like out of this machine.” In order to effectively train new staff, there is a significant need for machine specific training tools and that’s where QSQ is best. Check your inbox for your free espresso lesson.